The network of women we have in the wrestling community is truly incredible. From wives to girlfriends and female wrestlers themselves, strong, intelligent and talented women are helping to grow this sport in new ways. If you follow wrestling, you know who David Taylor is. Two-time NCAA Champ, U.S. National Team member and one of the most exciting wrestlers in the world to watch, Taylor is also known for having one of the cleanest diets in the sport. His wife, Kendra, founder of K2 Roots, is equally as cool in my book. It's also nice to have a friend who is as crazy about healthy food as you are! I asked Kendra to answer a few questions about juicing. Enjoy! 1. Why is juicing so important, especially to an athlete? For athletes, juicing is a great way to take any diet to the next level. Cold-pressed juice contains loads of micro-nutrients that will help aid recovery, energy, nourish cells, aid digestion, boost the immune system and help illuminate toxins or sugars from the body. It is easy for athletes' bodies to get worn down, especially while training multiple times a day. So, even if an athlete is eating vegetables with meals, adding a juice is only going to help make their systems run more efficiently. Not only that, but you can cram a lot more leafy greens through a juicer than you can fit on a plate. 2. 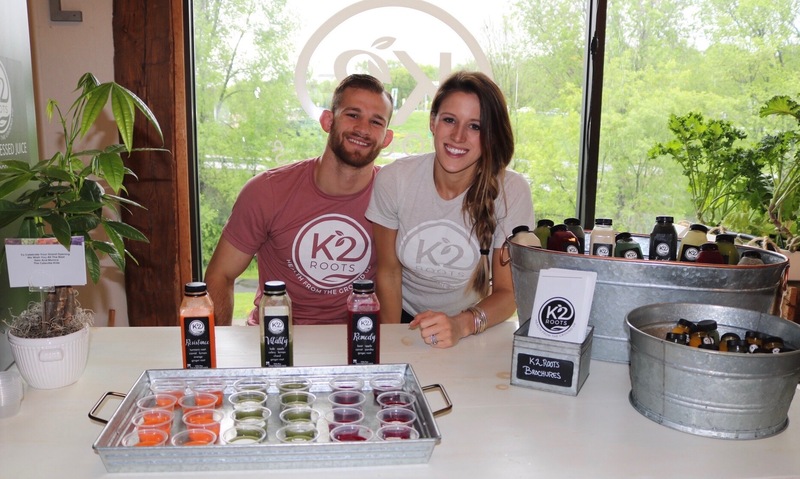 Why are cold-pressed juices, like those at K2 Roots, more effective than conventional juicing? There is such a vast difference between cold-pressed juices and conventional juices. More often than not, if you look at the nutrition label on a juice at the grocery store you will notice most are made from purees or concentrates, and have loads of added flavoring, preservatives, sugars and even coloring. They are also pasteurized using heat or pressure, which kills the nutrients in the fruit or vegetable juice. Although advertising can be very deceiving, in the end, a lot of these products end up doing more harm to one's health than good. Cold-pressed juice is made with raw fruits and vegetables using a slow press machine. The machines slowly churn the produce and emit the pulp separately. Although this is the slowest method, it is the safest way to maximize the nutritional value from produce! Unlike conventional juice, the live enzymes are still in tact after this process and juice can be safely stored for three to five days. Be sure to check the labels at stores. Even if you see “cold-pressed,” they may still use heat to pasteurize. The next best store bought juice you can find usually uses HPP (high pressure pasteurization). Making your juice at home or going to a juice bar and getting it made fresh are always great options! 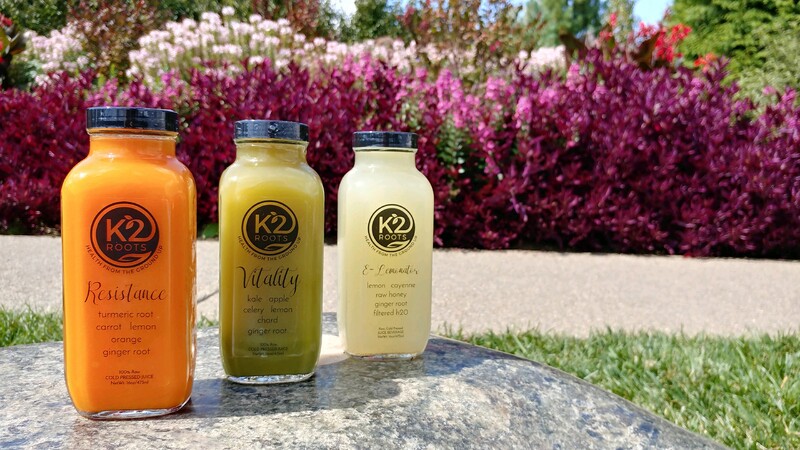 At K2 we source a majority of our ingredients locally. Farmers make sure they pick crops at their peak, so you get really great tasting fruits and vegetables. Not only that, but the less time produce spends between the farm and your table, the better nutritional value it has. Locally sourcing is also a wonderful way to support hard working members of the community and their families. When a consumer buys direct from a farmer, that farmer gets all of their profits rather than having to wholesale crops for WAY less or pay to go through a middle man. By supporting these farmers, you can support the community and help keep families on their land longer. Knowing farmers gives you insight into the land, the seasons, and your food. I hope to someday be able to teach my children about agriculture and nature -- where our food is grown! 3. If there are a few juiced ingredients you recommend consuming each day what are they and what are the benefits can they have? What benefits has David experienced since he started juicing? Two of our favorite ingredients are definitely ginger and turmeric! If you can find them in root form we recommend adding them to every juice. The biggest thing they do is help aid inflammation. Inflammation is basically our bodies response to outside threats - stress, injury, fighting illness, toxic chemicals, or infection. This is a crucial part of our body’s healing process. On the flip side, chronic inflammation puts people at a greater risk for joint damage, infections, deficiencies, or breakouts. Weight loss becomes more difficult and people are at a higher risk for many diseases. Adding ginger and turmeric to juices is great for preventing these things! I asked David what he has noticed most since he started juicing and he laughed and said, “I can grow a beard now!” Seriously though, he said the biggest thing he feels as a result of juicing is increased energy throughout daily activities. If he goes a couple days without juice he feels groggy and lethargic. Lastly, we both used to get sick multiple times a year, and cannot remember the last time we’ve been sick since we started juicing a couple years ago. That could be because of overall improved diets, but David still downs multiple green juices if he starts to feel worn down! 4. Why is it important to include juicing AND smoothies in your diet? Smoothies are great because unlike juice they contain fiber, which our bodies need. They are a great way to add extra fats, protein, and good carbs to your diet. Adding smoothies to your daily routine or post workout (especially for athletes who are burning crazy calories) can be a great way to make sure you are not in a caloric deficit and are getting all of the nutrients your body needs. At one point, when David was making the transition from 74 kg to 86 kg he did some testing and found he was burning around 4,400 calories a day. So in order to gain muscle mass he was supposed to be eating 6,000 clean calories a day! It can be super tricky ingesting that many calories in healthy solid foods, so smoothies were key. With juice, you do not get any of the fiber, so your body is able to easily absorb the nutrients without having to expend extra energy to digest the produce. You are also able to add greens and vegetables that might be a little less palatable in a smoothie - beets, chard, dandelion, bok choy, arugula, kale, cilantro, celery, etc. Adding a little pineapple or apple to the juice will actually mask those ingredients quite well! 5. Some people don't think juicing is worth the cost. Can you explain why spending a few extra bucks on quality food/drink is so important? The steep price tag can be tough to get used to at first. I have found some of our most loyal customers actually have juicers at home. Once they juice a few times and realize how much work and money goes into juicing at home, they gladly opt to pay for juices. Especially in today’s world, time is valuable, and juicing takes a lot of time! The way we look at it though, the food we put in our bodies is an investment rather than an expense. I would much rather try to build wellness than treat disease. Sadly, most illnesses are linked to food choices and ingredients so fueling your body well should be a priority. I also can’t help but question when people complain out about spending eight to nine dollars 16-ounce juice that contains three to five POUNDS of raw produce and superfoods, but don’t think twice about paying 10 dollars for a five-ounce glass of wine or a six dollar latte. If you can afford it, I always suggest trying it out for a couple weeks and seeing how you feel. Just know that once you start juicing, it’s hard to stop. If you plan to juice leafy greens, opt for a “masticating” juicer rather than “centrifugal,” which uses high speed and sometimes involves heat. The masticating machines will create a truly fresh product and also allows your juice to keep longer. Check out your local farmers market for local produce. Make a batch of three days worth at a time so you don’t have to go through the grueling juicing process daily. Rotate your vegetables! Our bodies are extremely adaptive so it is important to rotate what you are juicing and have balance. Wash your produce really well, especially if you shop organic. Bugs and dirt can get hidden in leaves and celery. Juice the peels of your lemons!